Help : Maintain your Resources. 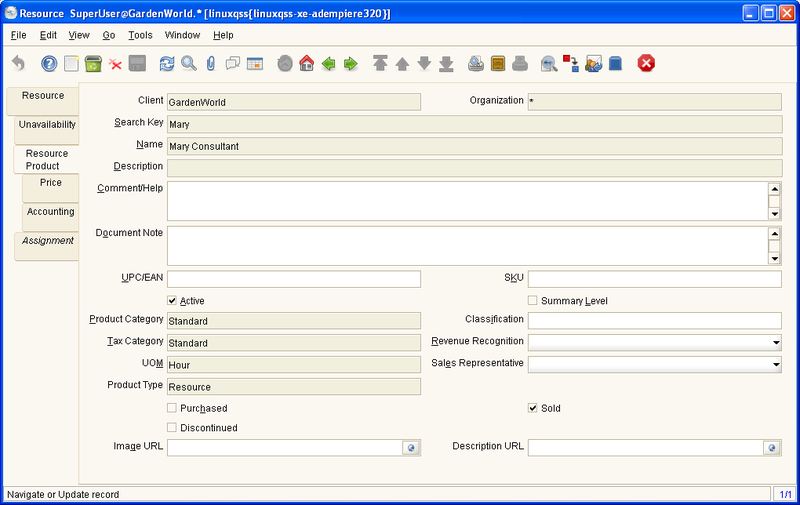 The product for the resource is automatically created and synchronized. Update Name, Unit of Measure, etc. in the Resource and don't change it in the product. Help : The product for the resource is automatically created and synchronized. Update Name, Unit of Measure, etc. in the Resource and don't change it in the product. Help : The Pricing Tab displays the List, Standard and Limit prices for each price list a resource is contained in. Help : The Accounting Tab defines the defaults to use when generating accounting transactions for orders and invoices which contain this resource. Not all accounts apply to resources. This page was last modified on 14 December 2006, at 14:36.